The Garnet Valley girls' basketball team celebrates after beating Neshaminy, 51-48, in the PIAA Class 6A semifinals in Plymouth Meeting. The Jaguars will face Peters Township in the state final Friday in Hershey. The Garnet Valley girls’ basketball team practiced “air hugging” each other after Sunday’s practice, anticipating a victory over Neshaminy in the PIAA Class 6A semifinals on Monday night. As the Jaguars have advanced further in their season with each win, they’ve been accustomed to forming a dog pile on the court. In Garnet Valley’s last win over Council Rock North, Jill Nagy fell victim to the bottom of the pile. When the senior point guard got out of the pile, she was diagnosed with a strained knee. After receiving treatment throughout the weekend, she started and played heavy minutes in the Jaguars’ 51-48 triumph over Neshaminy at Plymouth Whitemarsh High School on Monday night to advance to the state final. Garnet Valley put its practice plan into action when the clock struck zero. “We didn’t want to hurt our top point guard,” senior forward Brianne Borcky said, who finished with 12 points. Garnet Valley will play Peters Township, which beat Upper Dublin, on Friday night at Hershey’s Giant Center at 6 p.m. This game was a rematch of the District 1 title game, where Garnet Valley jumped out to a 17-point first-quarter lead and beat the Redskins, 63-53. It looked like it was going to be deja vu, as the Jaguars took a 23-13 lead in the second quarter after senior center Madi McKee’s bucket inside. But Neshaminy cut the lead to five at halftime, and never trailed by more than seven in the second half. Borcky’s two free throws with 1:01 left gave the Jaguars a 47-40 lead. Part of what kept the Redskins in the game was forcing the Jaguars into 20 turnovers. “I told [my team] at halftime, we were fortunate to be up five,” Garnet Valley coach Joe Woods said. Woods said his senior leadership is what carried his team to victory, despite the turnovers, and Allison Harvey’s potential game-tying shot that went in and out at the buzzer. 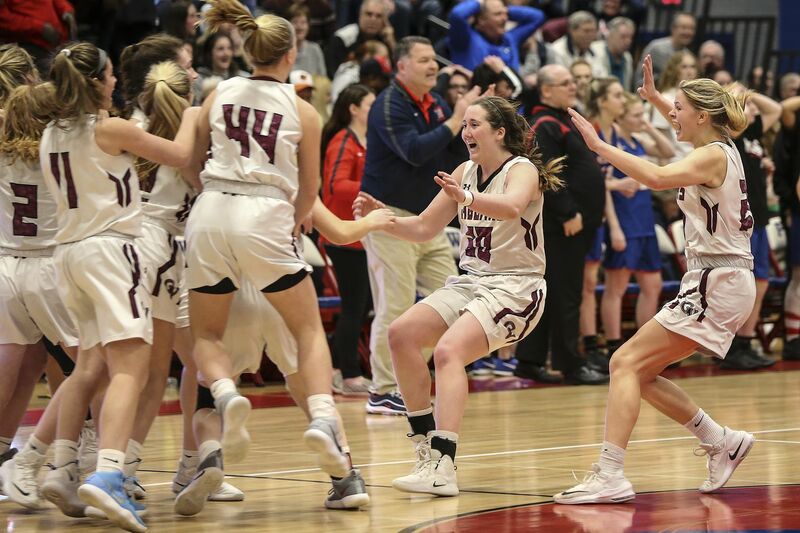 One of the those seniors, forward Emily McAteer, who is the all-time leading scorer in Garnet Valley boys’ and girls’ history, said making the state final is her best accomplishment. Though the scoreboard said Neshaminy lost, coach Joe Lally told his team otherwise in the locker room after the game. N: Kristin Curley 10, Allison Harvey 8, Alexa McCoy 3, Brooke Mullin 22, Kelli Kowalick 2, Emily Tantala 6. GV: Brianne Borcky 12, Liesl Dentinger 2, Morgan Falcone 7, Emily McAteer 17, Madi McKee 9, Jillian Nagy 4.